If you are looking for something to pack for reading on your summer holidays, then I recommend Jane Bennett’s Vibrant Matter. 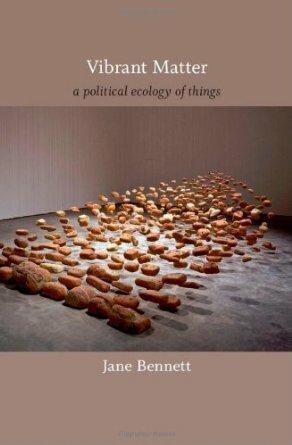 A Political Ecology of Things published by Duke University Press, Durham & London, 2010. This is a consummate, thoughtful and erudite work that challenges perceptions about our material, materialised and materialistic world. Through elegant and accessible prose this political philosopher carries the reader along with a delicious lexicon of words and phrases that help us reconstitute our (comfortable world) view by positively disturbing and disrupting our received wisdom. This might be an unsettling experience, yet her humility in delivery and cogent arguments raise something rarely felt when finishing a book. She delivers a strong sense of hope and a re-reading of how we might engage with negotiating our socio-cultural journey towards sustainability. She covers a broad philosophical terrain, invoking Latour’s ‘actants’ – ‘…Latour frames political action not as the enactment of choices but as the call-and-response between “propositions” (p103); Ranciere’s “partition of the sensible” (p105-107); the ‘assemblage’ of Deleuze and Guattari – ‘ad hoc groupings of diverse elements, of vibrant materials of all sorts’ (p23) and Henri Bergson’s ‘vitalism’, amongst other well known and lesser known sources. She recalls forgotten ways of perceiving our material relations such as the ancient English law, 1200-1846, of “deodand”, a “materiality suspended between human and thing”. Moreover, she raises doubts about the binary distinctions between biotic and abiotic, organic and inorganic, and other ontological divides. Yet the real potency of the text is in its gentle probing of our arrogant anthropocentric orientation. It is if we are stumbling around only half seeing. Bennett helps us open our eyes momentarily to see vibrant fresh realities and possibilities. As we are all agents of material change, are capable of materialising change, and all have the capacity to enact designs, it is a good read for everyone, but especially relevant to those who professionally design as their potential leverage has intentional and unintentional consequences. Cool. I’m actually reading “the art of possibility” in my holidays. Heard its good, but never heard of this guy… Are you two on holidays?! Sounds great, thanks for the comment! Just returned from my holidays, Alastair is still traveling. My holiday treat was a novel for once, Baricco’s Oceano Mare, very poetic… :) Enjoy the break!